To make accessing critical production data easier within the manufacturing enterprise, Rockwell Automation is launching the Allen-Bradley Stratix 5100 wireless access point (WAP) featuring a work group bridge. Unlike typical wireless clients that only connect a single IP address, the Stratix 5100 WAP enables engineers to connect up to 19 IP addresses simultaneously helping reduce design time when integrating machines and equipment into the industrialcontrol network. The Stratix 5100 WAP is ideal for industrial networks needing secure and reliable wireless connectivity. Enterprise-class silicon and optimised radios deliver a robust mobility experience that includes 802.11a/b/g/n with 3 by 4 multiple-input multiple-output (MIMO) technology and three spatial streams. The Stratix 5100 WAP uses Cisco IOS, providing world-class performance and configuration options. 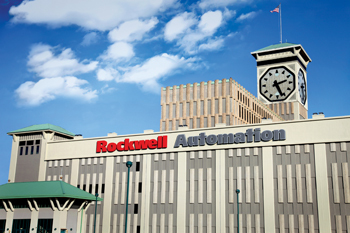 In addition, the Stratix 5100 WAP provides premier integration to the Rockwell Automation Integrated Architecture system with detailed network diagnostic information. The Stratix 5100 WAP complements the Allen Bradley ControlLogix EtherNet/IP communication modules and full portfolio of Stratix switches from Rockwell Automation. Earlier, Rockwell Automation announced the launch of the Allen-Bradley ArmorStratix 5700, its first on-machine switch. Built with ruggedised IP67 protection, the Layer 2 managed industrial Ethernet switch can be mounted directly onto a machine or application, reducing the overall size and cost of a control cabinet, and shrinking the machine footprint. The ArmorStratix 5700 managed switch advances connected enterprise goals by delivering integration of machine-level data that, due to cost or location, would otherwise remain isolated from business-level systems. Using the Cisco IOS network infrastructure software, this switch manages the transfer of production data to enterprise-level databases and information systems for improved decision making.